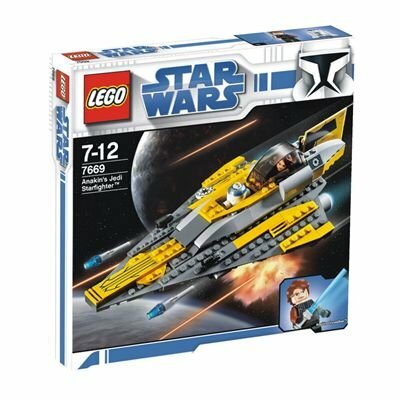 Looks like LEGO have re-released 7669 Anakin's Jedi Starfighter in the white Clone Wars packaging. So this is now a set the completist will want two of. LEGO S@H still shows the old black box. The Hailfire droid & Spider droid set was also released again in the white clone wars box. Unsurprising, Lucasfilm I expect was pushing for everything Clone Wars related to be easily recognizable in the new packaging style. There are also two different boxes for the Mos Eisley Cantina and 4483 AT-AT. I recently purchased Anakin's Jedi Star Fighter from S@H and it came with the new Clone Wars packaging. The box art also changed for 4504. As for Anakin's fighter, I thought it looked better before. I always liked the RotS box art with Vader on it. The new Clone Wars box art doesn't really appeal to me at all. And as long as we're on the subject, there's blue and black box versions of the Geonosian Fighter as well as blue and OTE versions of the 4500 Snowspeeder and 4502 X-Wing. Since I bought the set today (7669), I can reveal that the instructions has also been redesigned to match the box art. Yeah, I saw it in Woolworths just last week, they had both versions. It's the same with Toys R Us. Now that is one snazzy looking box. I wonder when the change over to the light side will be over in Australia. Yeah I saw the new boxes as well. Out of curiosity, we haven't seen this ship in the new series yet right? Dang. I'm a completist. I have the old box. But I'd actually rather it match the early '08 releases.